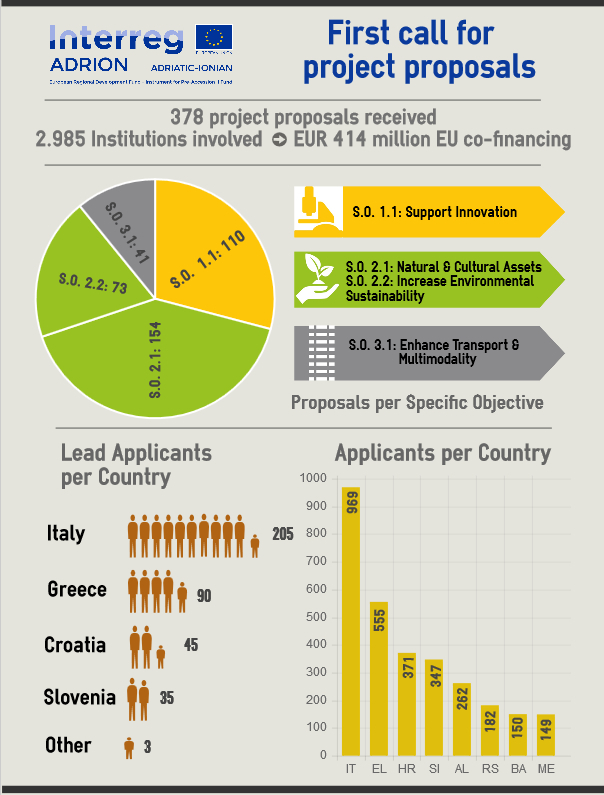 First call for project proposals was open from 1 February 2016 to 25 March 2016 (h: 17:00 CET). The programme received 378 project proposals. On 10 May 2017, the ADRION Monitoring Committee approved under conditions 35 projects, which have passed the quality assessment of the first call for proposals. The selected projects shall be now subject to further checks before the final approval. As far as the promotion of transnational capacity to tackle environmental vulnerability is concerned, four projects have been approved under conditions dealing with the harmonization of protocols and guidelines for the monitoring of contaminants in the marine environment; the creation of a common platform dealing with the Coastal Zone Management and Maritime Spatial Planning; the improvement of the early warning system and sea storms forecasting; and the safeguard of ecosystems by establishing a transnational network among protected areas. Under priority axis 3 – Connected Region – out of 31 eligible projects, ten projects have been approved under conditions. Projects tackle the promotion of intermodal transport; the improvement of motorways of the sea through the reduction of the administrative bottlenecks of the freight transport on the TEN -T corridor; the creation of a framework to support the implementation of technical systems for the distribution and supply of LNG (Liquefied Natural Gas) in port areas; the promotion of common standards for electric transport systems; the improvement of passengers mobility by boosting the intermodal connections between ports and airports and the rail transport connections. ADRION will offer the grant only to those selected applications, which will positively pass the additional checks (state aid, anti-fraud, financial capacity of private partners) and fulfilled the conditions for improvement. Errata Corrige for the eMS Technical Guidance is available. The eMS Technical Guidance has been updated accordingly. ADRION offers a template for the drafting of the document attesting the power of signature or delegation (one of the required attachments to the Application Form). The template is not binding and intends to be source of inspiration only. The document attesting the power of signature or delegation must be in line with the national rules of the affected partner.